If you're not outraged by this, you're on life support so I wonder how many Americans now feel what I feel today ~ I'm ready for real change, I'm ready for the honesty of Bernie Sanders ~ I can't wait to see Bernie debate Hillary Clinton as to where Americans really are, are they really being treated fairly in our present system and are our voices being heard and represented in our present plutocracy. “I am writing to inform you that I will be a candidate for President of the United States. I ask for your support. “For many months I have been traveling from coast to coast across our country, and have had the opportunity to meet with thousands of good, hard-working, and remarkable people. Like you and me, they are deeply concerned about the future of our country. “They wonder why they are working longer hours for lower wages. They worry about whether their kids will be able to afford college or get decent jobs. They fear that they may not have the savings to retire with dignity and security. “The challenges facing our country are enormous. “It's not just that, for forty years, the middle class has been disappearing. It's that 99% of all new income is going to the top 1%, and the grotesque level of wealth and income inequality today is worse than at any time since the late 1920s. The people at the top are grabbing all the new wealth and income for themselves, and the rest of America is being squeezed and left behind. “The disastrous decisions of the Supreme Court in the Citizens United case and in other related cases are undermining the very foundations of American democracy, as billionaires rig the system by using their Super PACS to buy politicians and elections. “And the peril of global climate change, with catastrophic consequences, is the central challenge of our time and our planet. “The middle class in America is at a tipping point. It will not last another generation if we don’t boldly change course now. As Mother Jones explains ~ This is not show business and unlike Hillary Clinton, his rival for the Democratic presidential nomination ~ Bernie Sanders didn't use a splashy, big-budget video to announce his campaign. Instead, the Vermont senator opted for a series of one-on-one television interviews Wednesday followed by a low-key launch event outside the US Capitol Thursday morning. "I believe that in a democracy, what elections are about are serious debates over serious issues," he said Thursday. "Not political gossip, not making campaigns into soap operas. This is not the Red Sox vs. the Yankees, this is the debate over major issues facing the American people." 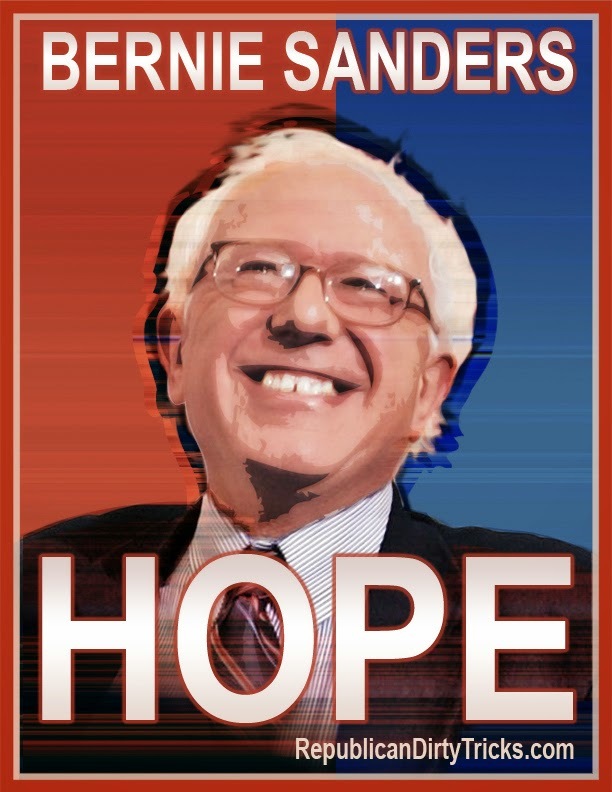 Bernie has my support and you may call me a dreamer but as John Lennon once sang ~ I'm not the only one ~ and my dream team ticket is a Sanders/Warren ticket for President riding a populist wave to victory in 2016. In some ways, it's David versus Goliath but never underestimate the power of honesty and the truth ~ it can change the world. Yesterday Bernie told a reporter “I think people should be a little bit careful underestimating me,” and, as a fellow truth teller ~ I most certainly am not making that mistake with Bernie Sanders. "That's Bernie Sanders's campaign -- he's the last Bull Moose in the forest."